I don't usually wear denim, especially with jeans because I'm not obsessed with monochrome much. But um, this outfit is actually cute, isn't it? Styling with wrapped choker is much more tremendous. After almost 19 years existing, I just realized that I look good in V-neck tops. They show off my neck and a little bit of my collar bones, a wonderful reason to wear my old necklaces and chokers. 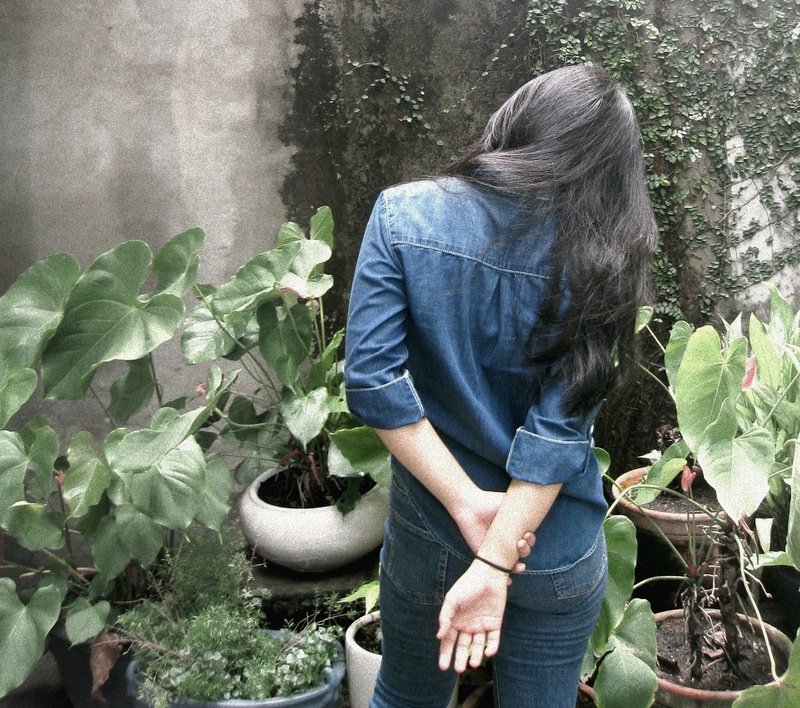 You look amazing in this denim on denim outfit! Double denim is a great choice! Nice look, casual and comfy! I like the necklace, original idea! Smell of the grass and trees is magical for me. <3 Nice photos and pretty outfit. I like especially your necklace. I was stuck with the background and when I saw those plants I was like "YES!" I love denim on denim! Perfect look! Love your outfit, you look pretty, thank you for sharing!!! Love this denim on denim look, Liz! So fab! Looking good in denim babe! Classic! Denim on Denim is my fave. In fact I'm wearing D on D right now. Such a simple and stylisch way to go. Great post and love your pics. LOVE this denim on denim look! Perfectly casual and the DIY necklace is such a nice touch! These photos are so awesome. Your blog is really cool - really fresh and different! Denim on denim looks great! I love your outfit! That necklace is gorgeous. Love the necklace, so hot right now! Also i must admit im a double denim fan, great look! Great look dear! Love the necklace! wow so lovely denims!! 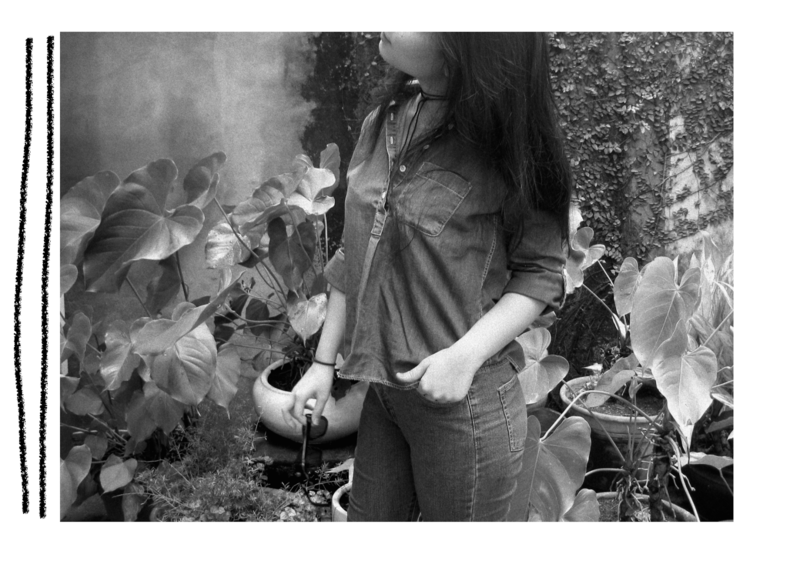 I like to wear denim jeans and shirt.. You can buy denim jeans and shirts at TheFemall.com at very affordable price. Oh my gawd. Such a gorgeous layout. I am in love. You are so pretty. 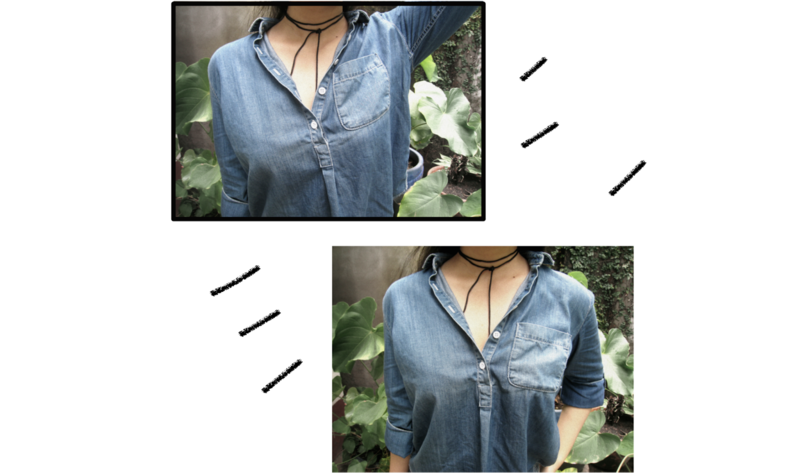 LOVE this denim and choker combo, you babe! Love how artfully captured these pictures are! I love you take on the denim on denim look <3 Those jeans hug your body so nicely. Hot hot hot!! Love this outfit! This necklace is awesome! Love how you edit your photos Liz, keep posting! Love how you worked that backdrop! And yes to the subtle details on the denim on denim ensemble.